That’s the headline of an interesting graphic The Economist has posted up (hat tip: Jim Geraghty, NRO), concerning a Pew survey of attitudes toward Sharia law and religious liberty in Islamic countries. 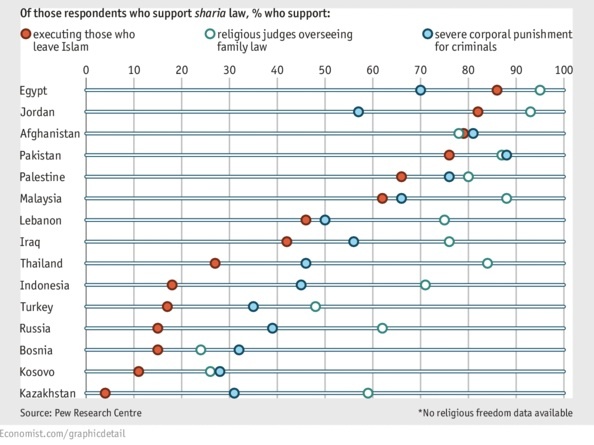 You’ll notice two things from the charts below: first, a severe case of cognitive dissonance, where large majorities say they support Sharia law, but also say they support religious freedom. The case gets more troubling in the second chart, which shows a clear divide between more secularized nations like Turkey, Russia, Thailand, etc, on the question of whether someone should be executed for renouncing his or her Islamic faith. 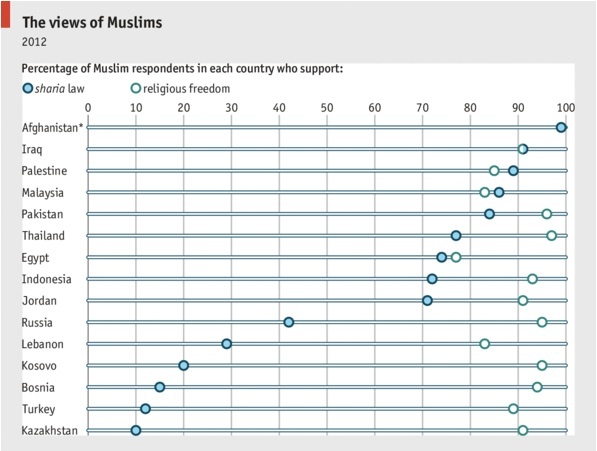 Doesn’t look like belief in “religious freedom” is very deep.